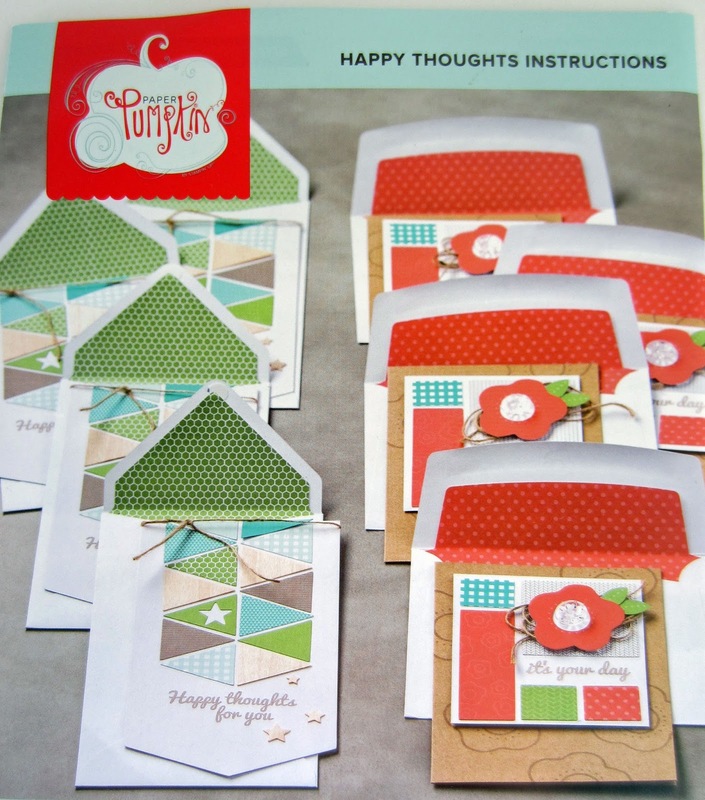 The last two Paper Pumpkin kits I received, June and July, were at the top of the list of my favorites. I mean, talk about adorable components! In the first place, I am not a coffee drinker. In fact, I have never even tasted coffee. So, all those funny coffee memes on the Internet mean absolutely NOTHING to me. Since I cannot relate to the coffee drinking mindset, the July kit in itself was not terribly appealing to me personally, especially the sentiment, "Thanks a Latte." 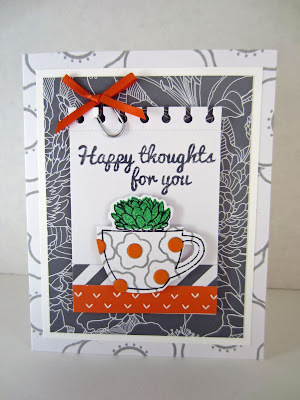 But, as a mashup of June and July, this card was exactly my style. 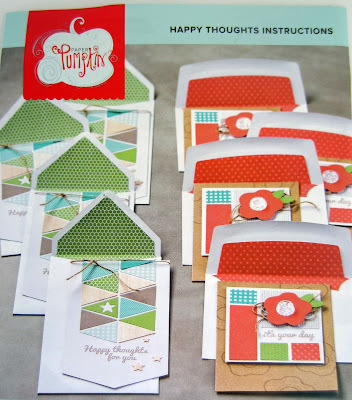 In the first place, I immediately fell in love with the two outline images of the simple flowers that came in the June kit. Although you mostly can't make out that's what I actually used, the gray images on the border of the white card base are some of the larger flowers in the abstract. This little addition breaks up the monotony of the pure white admirably. I love the way it looks! I used the smaller of the flowers to stamp in gray all over the diecut of the coffee cup. The centers of the little flowers were created with orange dots from a paper punch. 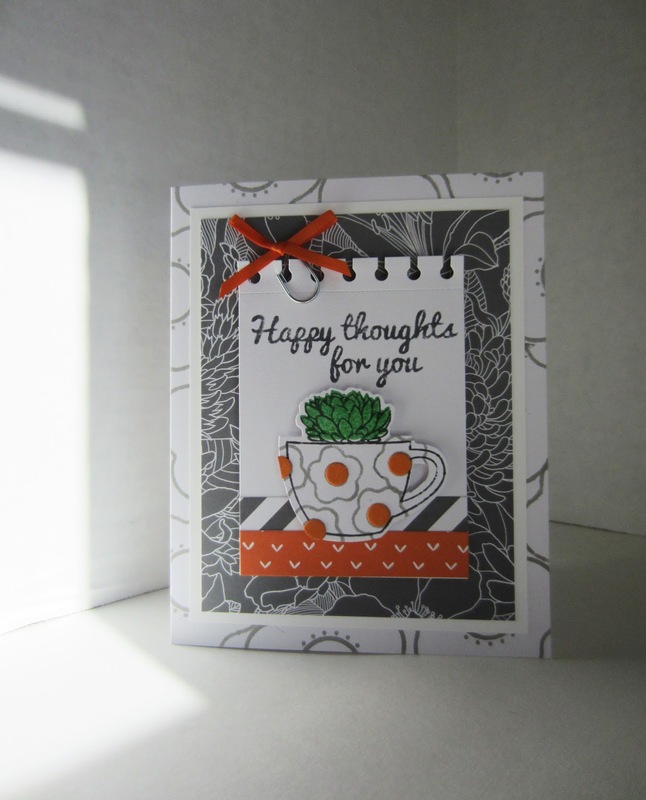 From the June kit, I also love the "Happy thoughts for you" sentiment, so decided to balance the notebook paper portion with that stamp, also in gray. Since I had the sentiment in the area where the cute bow paperclip was meant to go, according to the directions, I popped it onto the top of the sheet. I think I really like this mashup. How do you feel about it? Your card is cute! I love seeing different variations of the kit cards done. 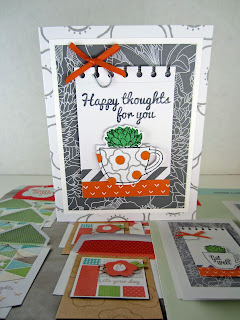 I love the card you made and thanks for sharing this at Cooking and Crafting with J & J.
Super cute! Hopped over from cooking and crafting with J & J.
I totally love this idea! So cute! 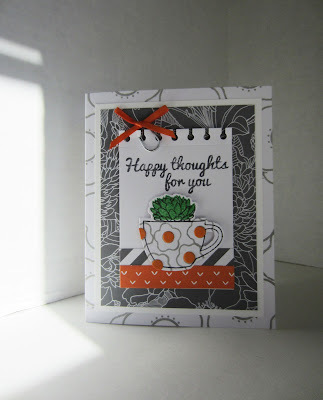 Thanks for linking up to Creative Mondays blog hop.. 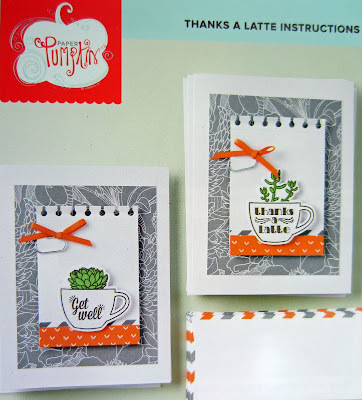 Thanks for linking at My Pumpkin Challenge with this - so fun to mix up the kits! Glad you found something that spoke to you! What a beautiful card. Also thank for linking up on the #HomeMattersParty this week and I hope you will come back and share again. Very Cute!! 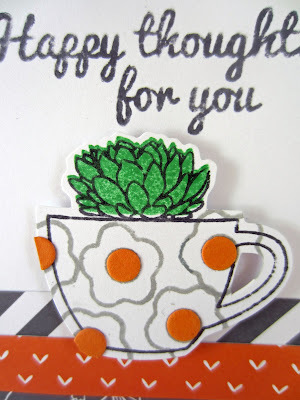 Thanks for linking up on My 2 Favorite Things on Thursday Link Party!! Hope to see you again tomorrow!! Love partying with you!! Pinned! 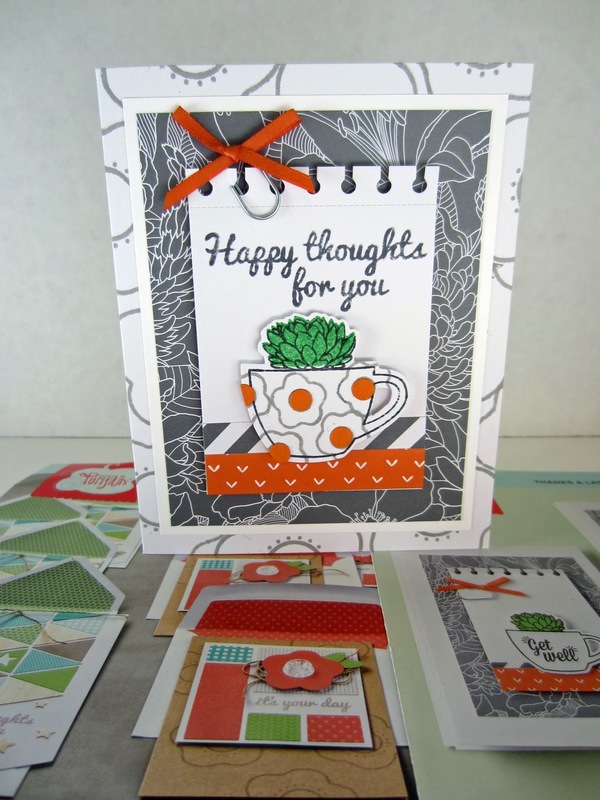 Hi Linda, I love how these cards turned out! Especially love the thanks a latte! Thanks for sharing your pretty paper crafts at the Inspiration Spotlight @DearCreatives Hope you have a great weekend ahead. See you again soon. Pinned & shared. there is some accident involved, so it's account because why it's account aggravation - and what you can do to minimise the risks.